Mr Zuckerberg made the announcement in a letter to Max on his Facebook page. He said they are donating their fortune to the Chan Zuckerberg Initiative because they want to make the world a better place for Max to grow up in. Mr Zuckerberg said the donation currently amounts to $45bn (£30bn). Max was born last week, but the couple only made the news of her birth public on Tuesday. 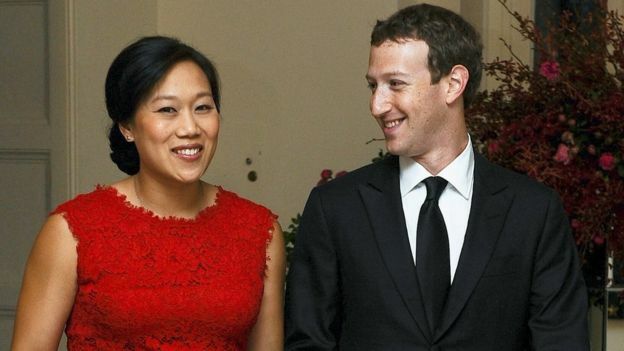 In his letter Mr Zuckerberg said the aim of the Chan Zuckerberg Initiative is “to advance human potential and promote equality for all children in the next generation”. Its initial areas of focus will be personalised learning, curing disease, connecting people and building strong communities. “Your mother and I don’t yet have the words to describe the hope you give us for the future,” Mr Zuckerberg said at the start of his letter to Max. “You’ve already given us a reason to reflect on the world we hope you live in,” it added. Billionaire investor Warren Buffet congratulated Zuckerberg and Chan, proclaiming that when it comes to giving away your fortune, “30 is the new 70”. No longer should billionaires wait to die before handing over money to a different generation, Buffet said, in a gushing approval of Silicon Valley’s newest and most influential power couple. Everything Mark Zuckerberg does is eyed with intense scrutiny, not least due to the nature of Facebook’s business of making money from personal data. But while the 31-year-old’s previous charitable efforts have been criticised for being too focused on building Facebook’s user base, this latest pledge appears to leave the Facebook business to one side. It’s a continuation of what we’ve seen developing over the past six months, where Zuckerberg appears at ease hosting heads of state as he does in the company of his own development team. The days of Mark Zuckerberg being seen as a nerdy, awkward tech dork are well behind us. His ambition now is clearly to be a significant figure on the global political stage. The letter highlighted the important role of technology in achieving the couple’s goals of advancing human potential and equality. “Many of the greatest opportunities for your generation will come from giving everyone access to the internet,” Mr Zuckerberg wrote to his daughter. He said more details about the donation will be released once he and Ms Chan return from paternity and maternity leave. Mr Zuckerberg said he will remain CEO of Facebook for “many, many years to come,” and Facebook said he is expected to be the controlling stockholder of the company for the “foreseeable future”.